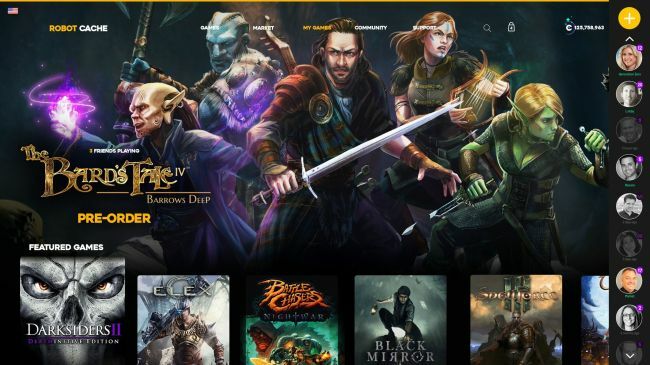 Robot Cache, the blockchain-based digital distribution platform that will enable its users to resell their games and mine cryptocurrency that can be used to purchase new ones, announced today that it will go into an early access period in October. Signups to take part are now open, and anyone who registers prior to the early access kickoff will be added to the Robot Cache Founders’ Club, which provides special offers and unique rewards including a Founders’ Club profile badge. That is perhaps not the most compelling motivator ever, but Robot Cache said (without getting into specifics) that other rewards would come from developers, publishers, and Robot Cache itself. More compelling, I think, is the crypto mining aspect, or more precisely the ability to put mined currency toward new games. You’re not likely going to end up rolling in the dough (one “Iron” token will be valued at roughly €1, although if values fluctuate as they do with Bitcoin, who knows where it could end up) but every little bit helps, as they say. The ability to resell games, for 25 percent of their value in Iron tokens, is appealing too: I’ve got a lot of stuff sitting on Steam that I’m never going to look at again, and it would be awfully nice if I could spin some of that into new games. To be clear, the Founders’ Club is not a paid subscription service: “Membership” is free. A hard kickoff date for the Robot Cache early access period hasn’t been set, but if you want that founder badge you should probably hit it up while you’re thinking about it. Hit robotcache.com for details and the signup link. Update: A Robot Cache rep clarified that the 25 percent in Iron tokens earned through the resale of preowned games is based on the current price of a preowned copy on the platform, which is set by the developer or publisher. So if a “new” copy of a game goes for $40, and a preowned copy is $30, reselling will earn a minimum 25 percent of $30. Developers and publishers can opt to give resellers a higher percentage, however.